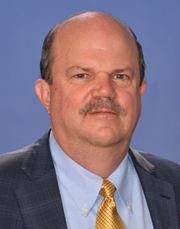 Jim Kelly joined the Miami-Dade Aviation Department (MDAD) in May 2015 as Division Director of Terminal Operations, supervising operations and customer services in the terminal facilities of Miami International Airport. Jim has worked in the aviation industry for more than 30 years, working his way up to airline management and, during the past 14 years, in airport leadership. Prior to joining MDAD, Jim served as airport business manager at Ft. Lauderdale-Hollywood International Airport, responsible for airline lease agreements, permits and licenses. He was also a terminal manager at Dallas-Ft. Worth International Airport, managing 31 gates with 200 flights daily. He is an active mentor to individuals interested in pursuing aviation management careers and is involved with both the American Association of Airport Executives and the Airport Management Professional Accreditation Program. Before graduating high school, Jim lived in the Far East, Washington, DC, Miami and Kenya because of his father's government assignments. He graduated from Embry-Riddle Aeronautical University with both a Bachelor of Science in Aeronautics and a Master of Business Administration in Aviation. Jim and his wife Christy currently live in Tamarac. His interests include classic cars, photography, travel and the ever-evolving aviation industry.